Each time a dynamo 2.0 script is reopened any saved speckle sender component has all its inputs and outputs duplicated. Hey @BCoop94 this happened to me too once, but couldn't consistently replicate it... Will look into it but if you can tell us how to replicate it it would be very helpful! @teocomi its caused by the exact version of Newtonsoft.Json library that you are using. It has to be v. 8.0.3. Don't ask me why. for some reason, lets assume we don't know it yet - the json constructor is not being called when the graph is opened - this is usually caused by json.net of a different version being loaded and runtime attributes evaluating to different types. Also have the user check for addins which are loading a different version of json.net - in the end the attributes are still compared at runtime, I'm not sure how frody will help here. @mjkkirschner Fody.Costura doesn't help here either because it checks the current app domain for loaded assemblies and then skips them if one is loaded. That means Revit would load the v8.0.3 and your packaged resource that comes with Fody will never be used. I would be interested to know what other addins the user has installed, since I think this extension has been working fine for others. @ksobon yes it's referencing v11 but it's not including it in the release, so should be using whatever Dynamo comes with. @teocomi I understand that you are not including it in the release, but that's not the issue here. As far as I understand the issue is that Newtonsoft.Json is a strong-named assembly. When you referenced that in your solution, it will look for that assembly at runtime, and it will look for the specific version that was referenced in your solution (that's what strong-naming is for). So the fact that you are not including it doesn't make a difference here because I think that even though Revit loads v.8.0.3 your solution is looking for v.11.0.1 and it can't find it. if you have to have a dependency on v11.0.1, then try adding Assembly Resolver ex. AppDomain.CurrentDomain.AssemblyResolve or edit the App.config to point at the specific version dll in your app's sub-folder. I think you will have to actually start including the file. if you don't have to have a dependency on v11.0.1, then consider changing it to v.8.0.3 which is the version used by Revit and Dynamo out of the box. That has proved to work relatively well for me in the past. what version of speckle are you using? does this issue occur ALL the times or only SOME times? does it also occur when using Dynamo sandbox: C:\Program Files\Dynamo\Dynamo Core\2\DynamoSandbox.exe ? So far the issue has occurred all the time upon reopening a save file. I can not replicate the issue in Dynamo sandbox. Thanks @BCoop94 , since you cannot replicate the issue in Dynamo sandbox, it makes me think there's a compatibility problem with another plugin/package. 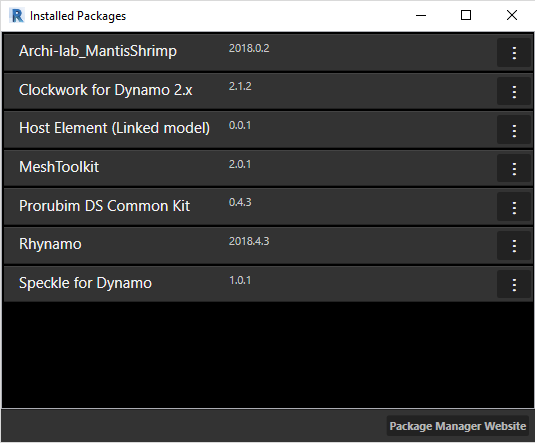 Can you please send me a screenshot of your installed Dynamo packages (Packages > Manage Packages...)? A screenshot of the installed Revit plugins would also be helpful if you can share it. 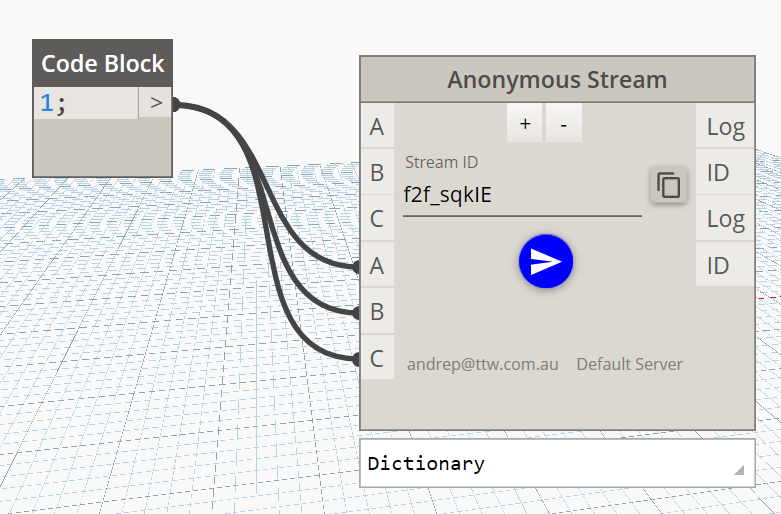 I just installed Revit 2019 (19.0.0.405), Dynamo 2.0.2 and the latest Speckle, and I'm getting the same behaviour. I have no other packages installed. I create a new sender, plugged some random values, and saved the Dynamo file. We deployed our own server, so I tried the same in the Speckle Hestia server and inputs and outputs are repeated. Hi both @pereiraTTW @BCoop94 I still cannot replicate the bug, my guess is that it's a Revit plugin causing the problem. To disable the plugins, just move them to another folder. To send them to me you can zip them and share them on Slack. On Feb 7, 2019, at 7:43 AM, Matteo Cominetti ***@***. ***> wrote: Hi both @pereiraTTW @BCoop94 I still cannot replicate the bug, my guess is that it's a Revit plugin causing the problem. Could you please either: temporarily disable all your revit plugins and try again send me a copy of your revit plugins and I'll try myself (if you can share them) The Revit plugins are generally stored in a few locations: %appdata%\Autodesk\Revit\Addins C:\ProgramData\Autodesk\Revit\Addins C:\ProgramData\Autodesk\ApplicationPlugins C:\Program Files\Autodesk\Revit 20XX\AddIns\ To disable the plugins, just move them to another folder. To send them to me you can zip them and share them on Slack. Thanks for your collaboration! — You are receiving this because you were mentioned. Reply to this email directly, view it on GitHub, or mute the thread. just chiming in, I could replicate the same issue on Revit 2019.2, no extra add-in apart from anything that comes with Revit. I encounter the same problem in another package (https://forum.dynamobim.com/t/jsondata-package/19026/25), and solved it by downgrading Json.Net to 9.0.1. @ksobon thanks for the heads up! @mjkkirschner if I changed the logic of my constructors to handle this scenario, do you see any other possible conflict happening? @teocomi, thanks for that. Please, keep us posted.